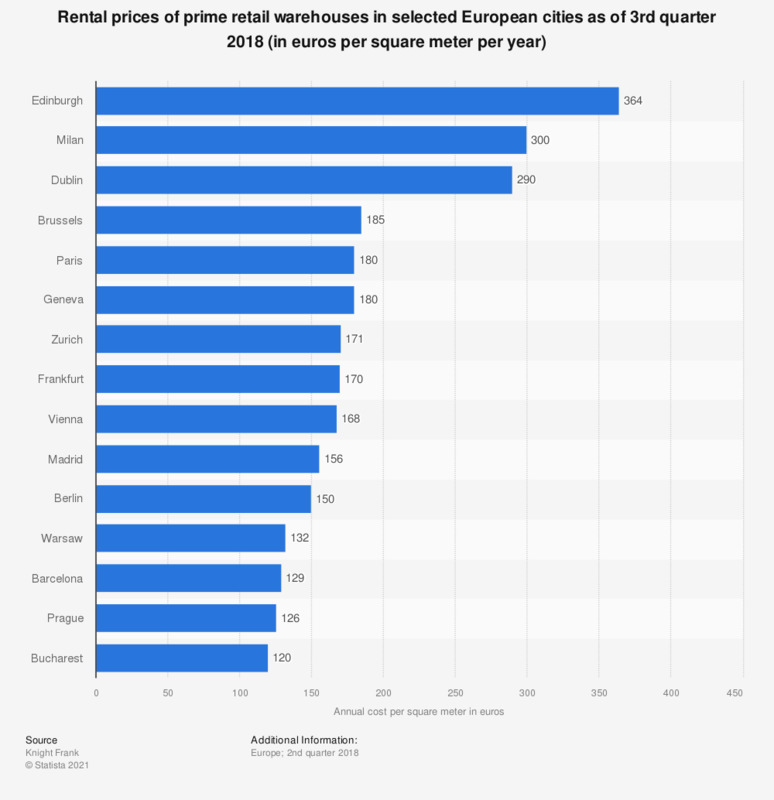 The statistic displays the rental prices for retail warehouses prime rentals in selected European cities, as of the third quarter of 2018. Retail warehouses typically range from fifty thousand to hundreds of thousands of square feet. They are used for keeping and distributing inventory. Retail warehouses include loading docks, truck doors and large parking lots; also they may contain a limited amount of office space. Prime retail warehouse properties belong to the wider category of industrial property, along with other real estate types, such as: distribution buildings, showroom facilities, manufacturing buildings, cold storage facilities, telecom or data hosting centers, "flex" buildings denoting more than one industrial or commercial facilities housed in the same building, and finally R&D buildings. In the third quarter of 2018, figures show that approximately 364 euros were paid per square meter per year for prime warehousing properties on the Edinburgh commercial real estate market. This was a decrease, compared to the earlier data (according to the same source), which calculated the rentals to be 419 euros per square meter per year in the 1st quarter of 2016. In other leading Western European cities in 2018, the cost for warehouse square meter per year was significantly lower: in Paris it amounted to 180 euros, and in Bucharest, to approximately 120 euros. The average price of large prime warehouses that are not specific to retail can be far less expensive per square meter per year, especially in the east of Europe.